In February this year, a team from Prime Accountants consisting of Directors, Morgan Davies, Jamie Skelding, Steve Harcourt and Glen Callow as well as Senior Payroll Manager, Kerrie Given and Marketing Manager Jonathan Stobart, took part in Cyclone24 Derby. 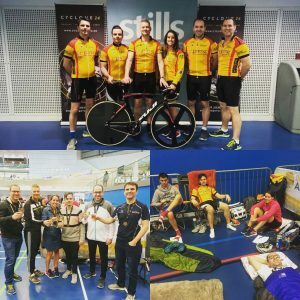 As charity has always been at the very heart of the Cyclone24 challenge, along with our passion to be an inclusive challenge that is open to all, and encourages those who have never ridden on the velodrome track to give it a go, we really enjoyed reading this account of the Prime teams journey. “As part of our continued effort to raise money for our two nominated charities, Zoe’s Place in Coventry and SoLO in Solihull, we like to take part in challenging fundraising activities. Cyclone24 is a 24 hour endurance ride around the Velodrome in Derby. The team of six had to ensure there was a rider on the track for the entire 24 hour period. 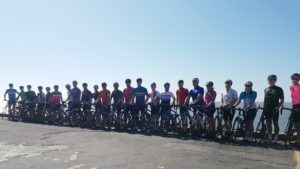 There were various elements of the challenge that worried the team before embarking on the event, obviously the cycling was a big factor, as was the lack of training and experience of track cycling, not sleeping was also a major concern. Upon arrival at the venue it quickly became apparent that the other teams were better prepared than we were, the majority of teams seemed to be very serious cyclists who had brought so much equipment that it wouldn’t look out of place in an F1 pit spot. They all seem to have brought their own bikes, spare wheels, turbo trainers. The Prime team on the other hand had brought sandwiches and a blanket! To say we felt a little out of our depth was an understatement. As the challenge started the difference between us “the novices” and the experienced riders quickly became apparent and our position on the leader board was evidence of this – 18th out of 19 teams. Unsurprisingly the most challenging aspect of the event was the lack of sleep, the team attempted to get some sleep by splitting into two groups to allow for a period of rest. The time spent in bed was about an hour, and by “bed” we mean the floor of a sports hall and by rest we mean lights on, loud beeping from the timing chips and the chatter of the other teams around. Despite our best efforts it quickly became obvious that the velodrome in Derby wouldn’t be challenging the Premier Inn for the best night’s sleep anytime soon. Staying well nourished was vital to successfully completing the challenge and something Jonathan took very seriously. So seriously in fact it’s believed that Jonathan is the only competitor ever to cycle for 24 hours and gain weight at the end. He claims this was due to the amount of water he took on board and the 3 club sandwiches, hot dinner, four chocolate bars, pizza, bag of sweets, MacDonald’s breakfast and fizzy pop had absolutely nothing to do with it. As the end of the challenge approached the team was delighted to be joined by friends and family who gave an extra lift for the closing stages. By this point legs were stiff, bums were sore and everyone was absolutely exhausted, however having people watch on made us push that little bit harder and we moved a bit quicker around the track… well it felt like we did anyway. We finished the challenge by completing 3,122 laps (484 miles!) finishing 18th out of 19 teams. To us it didn’t matter how many laps we completed or what position we finished, we took part to raise money for our charities and we are very proud to have raised £3,900 for Zoe’s Place and SoLO. We think this is an outstanding effort in both fundraising and cycling. Derby 2018 was the first challenge where all teams taking part went past the 3000 lap marker. Congratulations to the Prime team and we hope that we may see you again at future challenges!